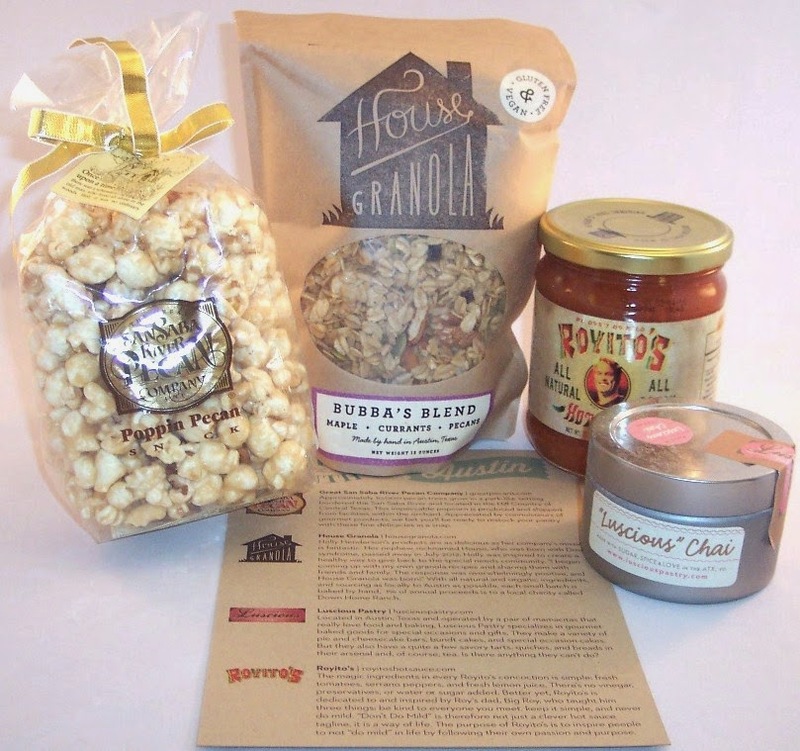 Batch Austin Gourmet Food Subscription Box Review, September 2014 + 10% Discount Code! Over the past few months, the Batch Nashville folks offered a fun "Tour of the South" series of gourmet food boxes which included stops in Birmingham, Atlanta, Charleston, New Orleans and Austin. 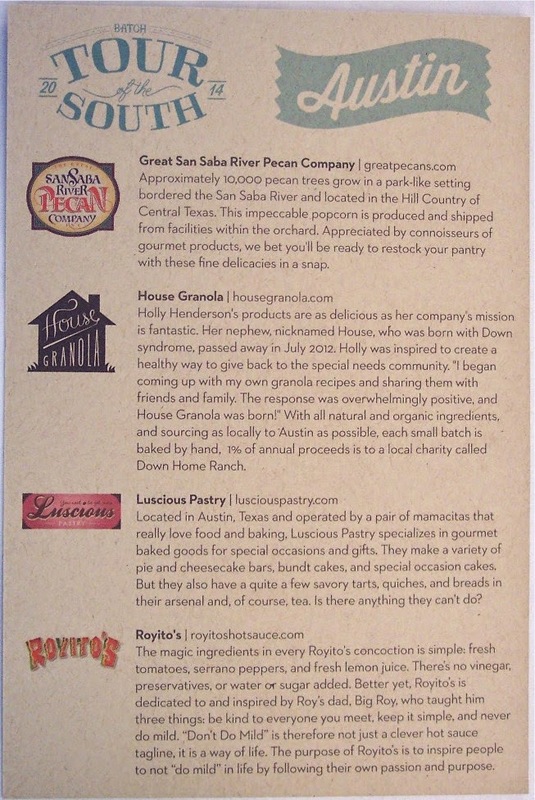 Subscribers received monthly boxes featuring foods that represented each city. The tour concluded with the Batch Austin box, which I've just received. As soon as I cleared all the packing out of the way, I knew I was going to like this box! 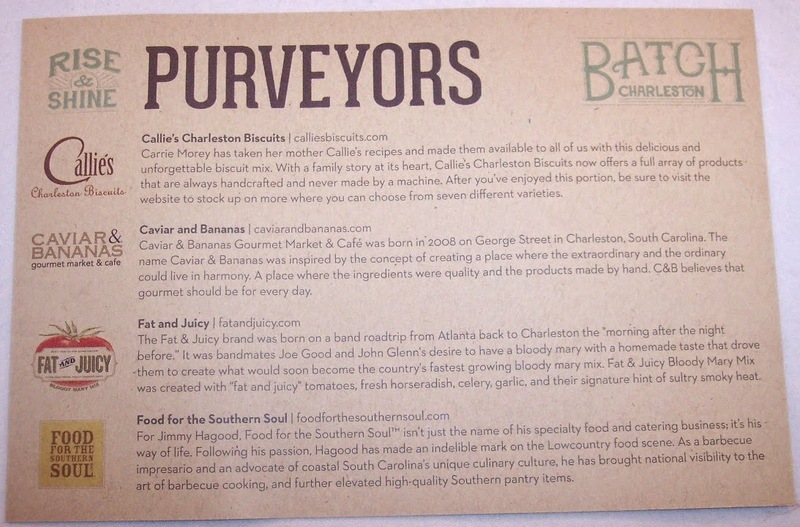 First out is the information card which tells about the purveyors and the products included. 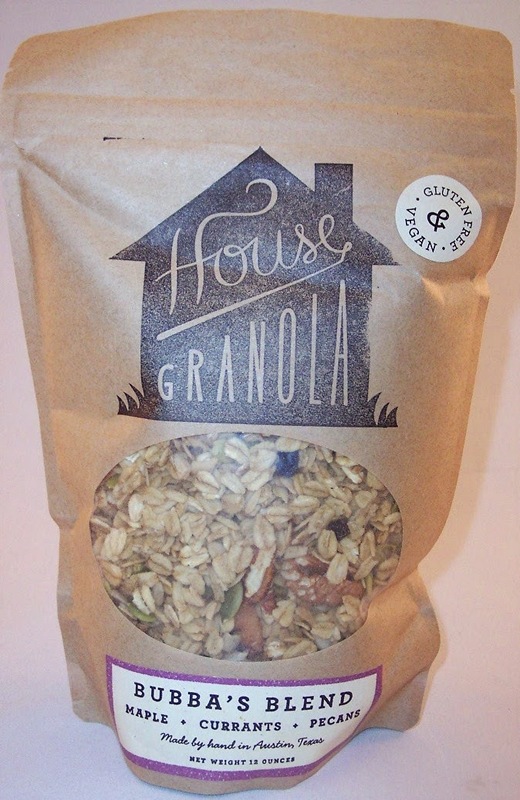 A really delicious looking bag of Bubba's Blend granola from House Granola immediately caught my attention. This 12 oz. bag features maple, currants and pecans...all natural organic ingredients. As a snack, this should last me a long time! There is a 7 oz. 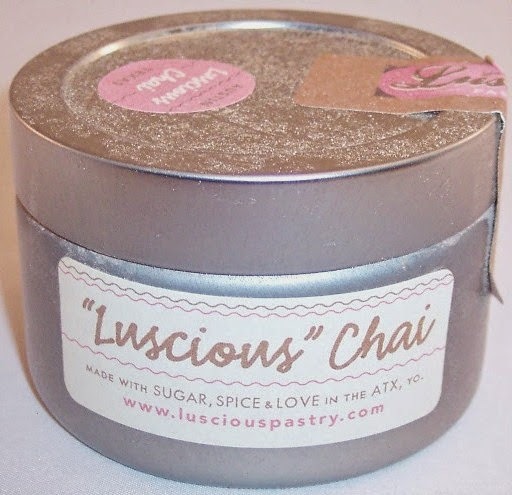 round tin of "Luscious" Chai tea from Luscious Pastry, which specializes in gourmet baked goods. I'm not very familiar with chai teas but this one is a black tea flavored with vanilla, cinnamon, ginger, cardamom and other spices. Sounds good! 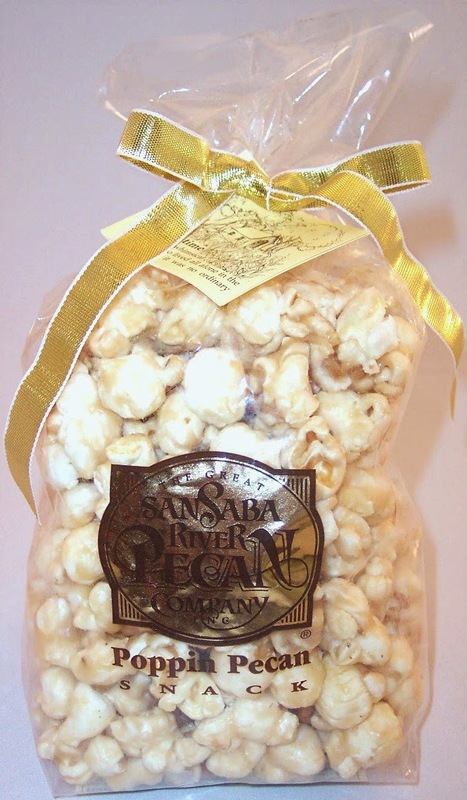 My favorite item is this "Poppin Pecan" popcorn from The Great San Saba River Pecan Company which is located in the Hill Country. This product is actually produced and shipped from a facility inside the pecan orchard. This one could not wait....it is delicious! Of all the Batch boxes I've tried, Austin's was my favorite. I'm not exactly unbiased. In another lifetime, I lived in Austin for a couple of years, graduated from U.T. and have family there now. Not to incriminate myself, but let's just say there were NO bats in Austin when I lived there! Austin has changed dramatically in the past thirty years but its epicurean delights just get better and better. Unfortunately, I don't see an option to purchase the Batch Austin box currently since the "Tour of the South" series has concluded. However, you can still subscribe to Batch Nashville, Charleston or Memphis and you can also purchase many of the individual items featured in recent boxes under the Shop tab on their site. If you don't want to commit to a subscription, there are a lot of interesting looking one time purchase gift batches. (Great holiday gifts, by the way!) Click here and use code BATCHTASTIC to get 10% off your order. Please be aware that this code does not apply to subscriptions...only to seasonal Batch purchases or gift purchases. Keep an eye on Batch's site; I wouldn't be surprised if they eventually add other subscription options or tour series boxes! P.S. Batch is about to open a retail store in Nashville. If you're interested, check out this article for more information. They have a great concept and I would like to see them succeed and expand the number of featured cities! 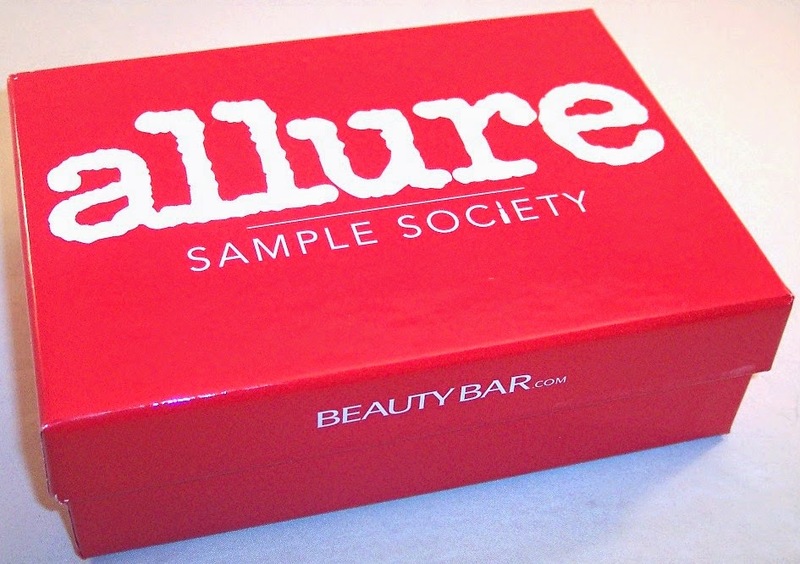 Allure Sample Society Beauty Box Review, September 2014 + $5 Discount Code! Can you imagine the flood of cosmetics that must cross the average beauty editor's desk each month? That's got to rank right up there in the list of world's greatest jobs! We can't all be beauty editors but we can benefit from their access to the latest products through the Sample Society subscription box, which is curated by the editors of Allure magazine. Sample Society recently re-vamped their entire service and one of the benefits is their sleek new packaging...a glossy red box. As any beauty addict knows, packaging does count! Inside the September box are four luxury samples and one full size product, whose inclusion you might have guessed if you read my last review. As always, there is a little magazine put together by Allure's beauty team that pictures and tells all about each product. This is quite helpful, particularly with products you may not have tried before. The holy grail in this box is the full size (.5 oz.) Restorsea Revitalizing Eye Cream, which retails for a whopping $85. The chance to try an expensive product that otherwise would have languished on the department store shelf due to its high price....Ladies, this is why we subscribe to monthly beauty boxes! The fact that it's an eye cream makes this even better. Not only does this product pay for the box; it probably pays for the next four as well. O.K., I'll stop gushing but as you can probably tell, I am thrilled to get this item....thank you Allure! Now that I've calmed down, Restorsea is a deeply moisturizing, anti-aging eye cream that is safe for sensitive skin and eyes and for contact lens wearers. It reduces fine lines and crow's feet and disguises crepiness. It is a very lightweight odorless white cream that spreads and absorbs beautifully. Although the container is quite small, very little product is needed for each application so I expect this to last a long time. The Restorsea is a VERY hard act to follow but the next item is a 1.35 fl. oz. 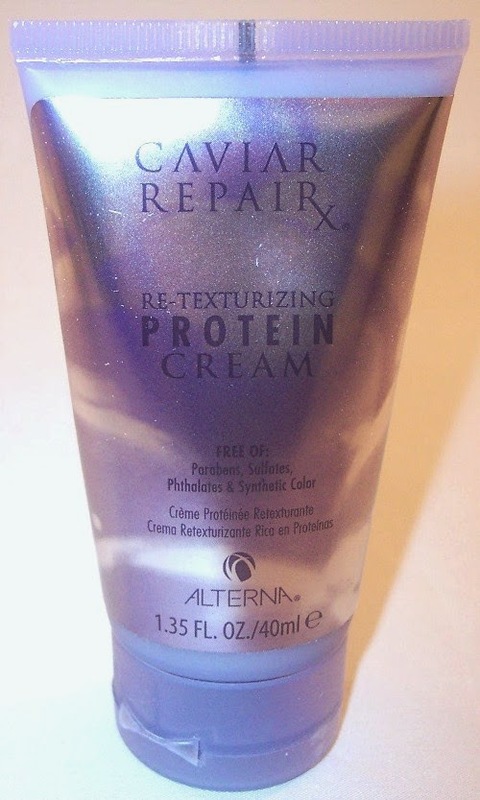 sample of Re-Texturizing Protein Cream by Alterna Caviar Repairx. This is a leave-in conditioner (another favorite product of mine) specifically formulated for dry, puffy and/or damaged hair. This moisturizes and smooths hair cuticles and I think will be particularly effective with thick, coarse hair. It has a light citrus scent and there's enough here for probably seven or eight applications, depending on how much is used at a time. Full size retail $35. As I've said before, I don't really care much for fragrance samples. They are too easy to get for free in stores and I tend to reach for my full size perfume bottles when I want to use scent. But, the beneficial glow of my Restorsea high shall benefit my review of this product! 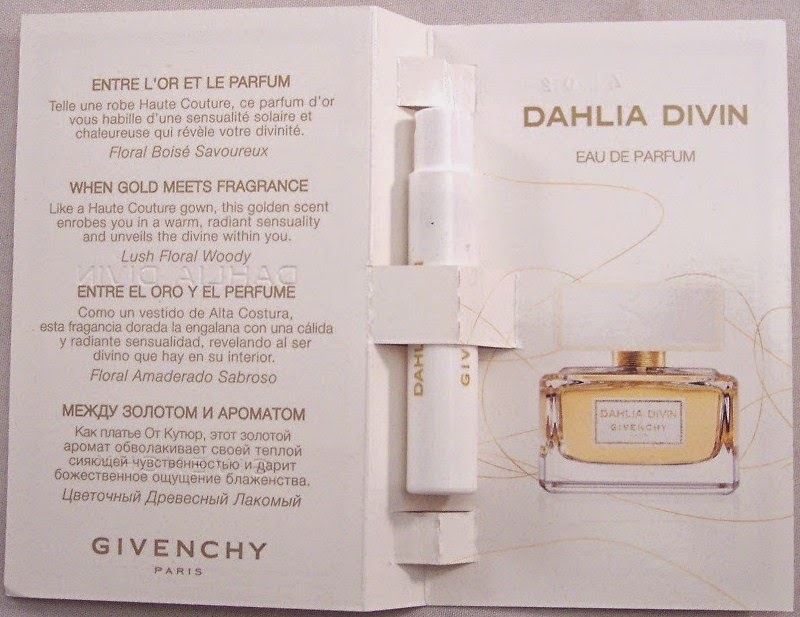 The first word that popped into my head when I spritzed a tiny amount of Givenchy's Dahlia Divin Eau de Parfum on my wrist was "expensive". This has notes of jasmine, patchouli, sandalwood, vetiver and Mirabelle plum. I would describe it as a complicated medium-strength and very elegant scent. Full size retail $65 and up. 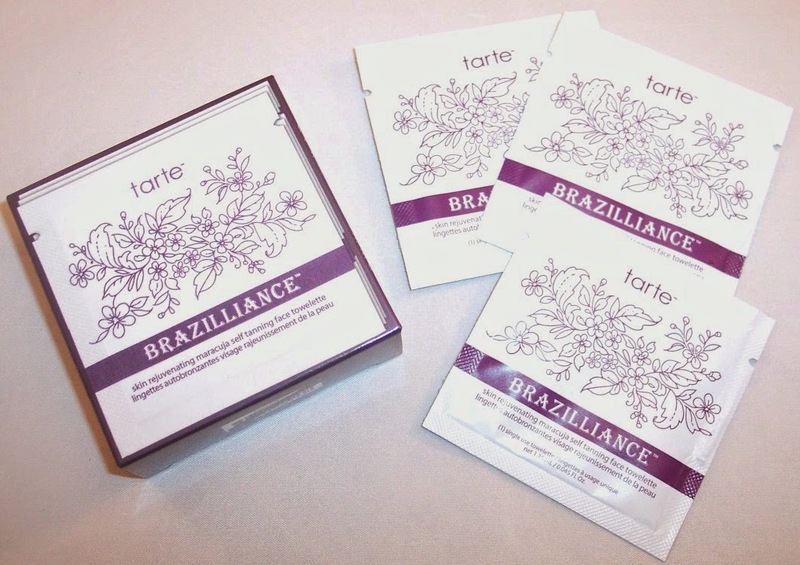 I am completely unfamiliar with self tanning towelettes so will have to reserve judgment until I have a chance to try these Tarte Brazilliance tanning wipes. They are said to deliver a natural-looking bronze in a matter of hours without the smell. Of course, smell is an issue with a product that is applied right under the nose so the lack of scent is supposed to be a big benefit of this product. We'll see. At $9 retail for a box of three of these, they better work! The final product in September's box is a deluxe sample (.17 oz.) 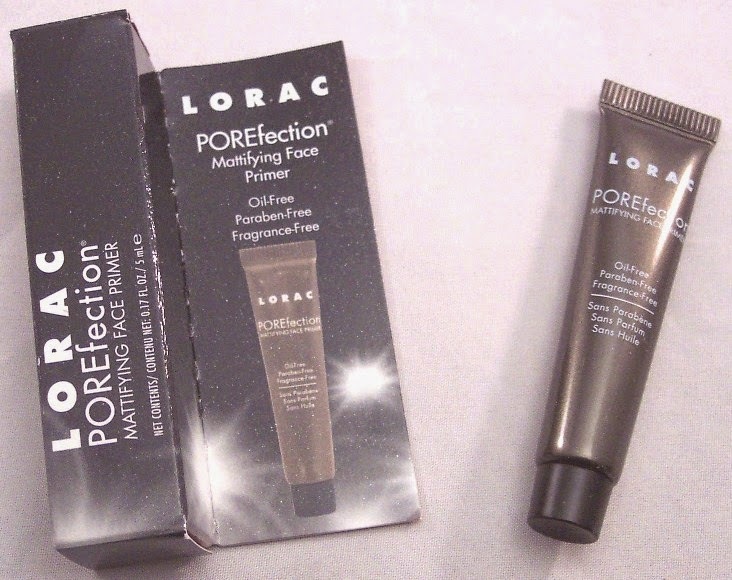 of Lorac's Porefection Mattifying Face Primer. I'm a little skeptical about face primers in general. Unless you are serious about makeup, I'm guessing face primers are a step that many women skip. The premise is that a primer should hold face makeup in place, particularly in stressful environmental conditions like heat and humidity. This is a clear gel that contains salicylic acid (always a good thing) and antioxidant vitamins. I'd say there is enough product here for several applications. Full size retail $32. 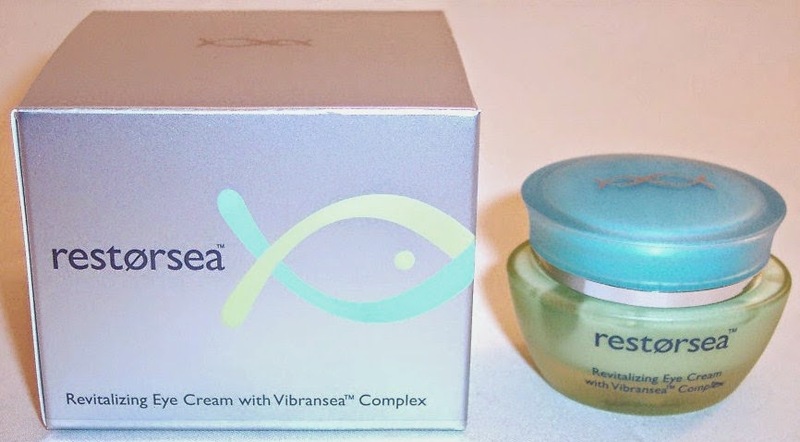 Well, it should be obvious that the Restorsea Eye Cream is the HUGE winner in this box. I hope that Allure will continue to provide full size high end products with such broad appeal in the Sample Society boxes. In general, I have been quite impressed with their re-engineered boxes and can't wait to see what comes next! Don't forget to subscribe to this blog to get the latest subscription box reviews and discount codes! Excludes existing customers of BeautyBar.com, Diapers.com, Bookworm.com or other Quidsi sites. Restrictions apply. 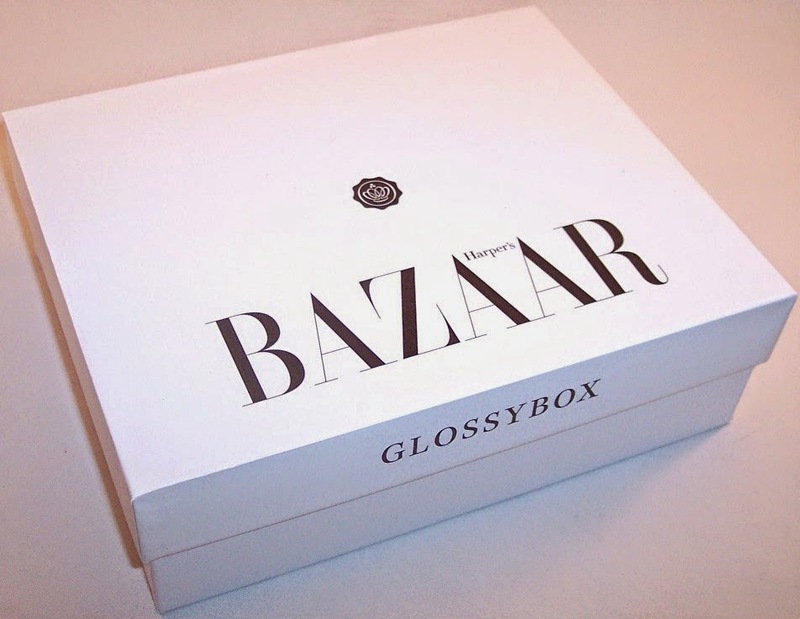 Glossybox Harper's Bazaar Edition Review, September 2014 + 20% Discount Code! In keeping with the box's stark and elegant appearance, the products inside are intended to produce a chic minimalist fall look. They are minimalist and they are chic but they don't seem particularly fall-related to me. The five items in this box (2 full sizes and 3 luxury sample sizes) are all things I would use year round. The accordion pleated information card shows a full size color photo of each product, tells about the item, provides application tips and gives the retail price for the full size equivalent. 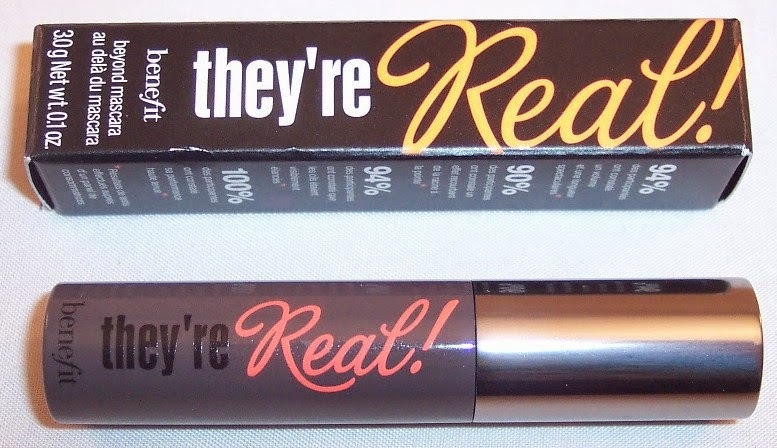 I'm not crazy about mascara samples but since the full size "They're Real" by Benefit retails for $23, this is probably the only way I'll ever try this one. It does a great job of lengthening, volumizing, curling, lifting and separating. I'm pretty sure I've received the same sample in at least a couple of other beauty sub boxes this year. 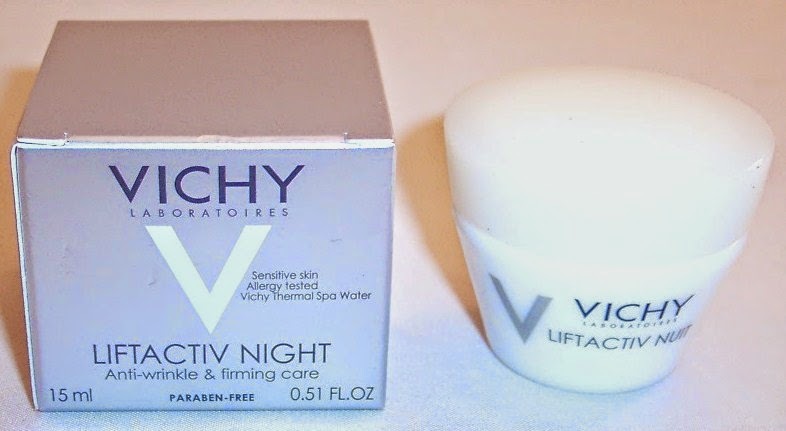 An elegantly packaged sample of Vichy's Liftactiv Night cream promises to reduce the appearance of wrinkles, boost firmness, hydrate and improve skin tone. My favorite beauty box samples are night creams and eye creams so I'm happy to try this one. Full size retail $50.00. The final product is Obsessive Compulsive's Lip Tar: Metallic in the shade "Authentic". Because of the color, I'd say this is the only item in the box that actually relates to fall. This is a full size lip gloss in an opaque bronze copper shade with an intense shimmer finish. It comes with a tiny precision brush for perfect application. I don't know that this color will work for me so this may end up being gifted. 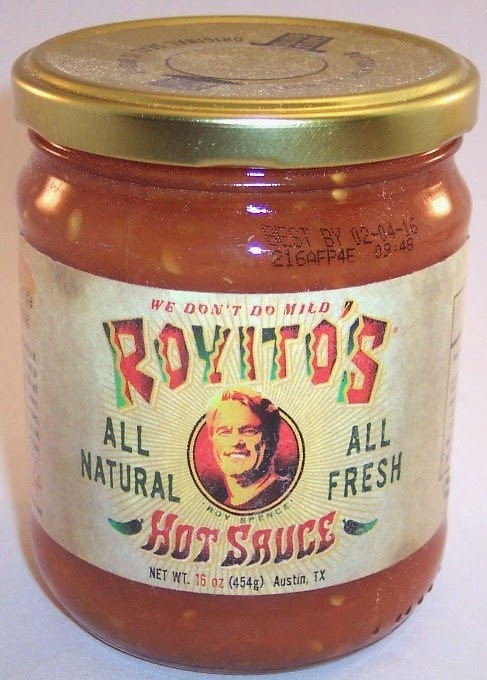 Retail $18.00. Because of the sample sizes, it's really hard to say what the retail value of this box is but it clearly exceeds the $21 price tag for one box. 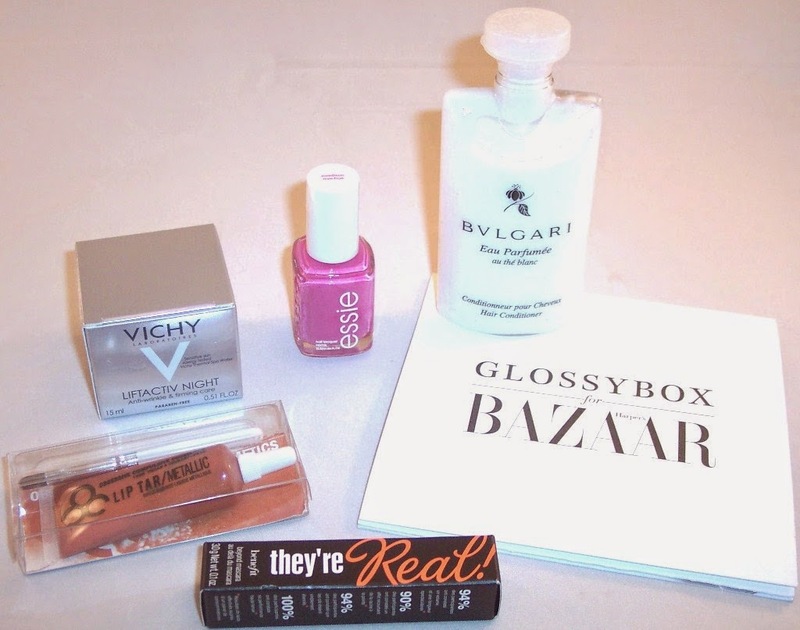 My favorite items in this box are the Bvlgari conditioner, the Essie nail polish and the Vichy night cream. For an even better deal, use the code FALL14 to get 20% off a 3, 6 or 12 month subscription. This works out to $16, $15.33 or $14.67 respectively...an unbeatable value in my opinion. I rarely sign up for a full year with any subscription box. Although the economies are there, many of them are just too unstable as businesses to commit for that long. Glossybox however, has provided consistently high quality and reliable delivery since their U.S. debut a couple of years ago. Because of that, I feel comfortable in paying for a year in advance to get the maximum discount. 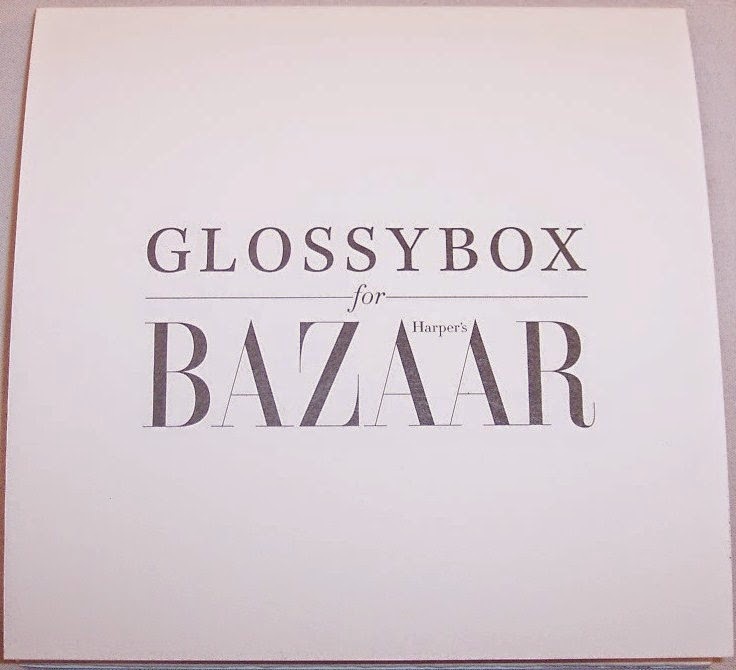 Glossybox seems to be doing more partnering with high end fashion brands this year. The co-branded boxes and products are really adding interest and value to this subscription as far as I'm concerned. 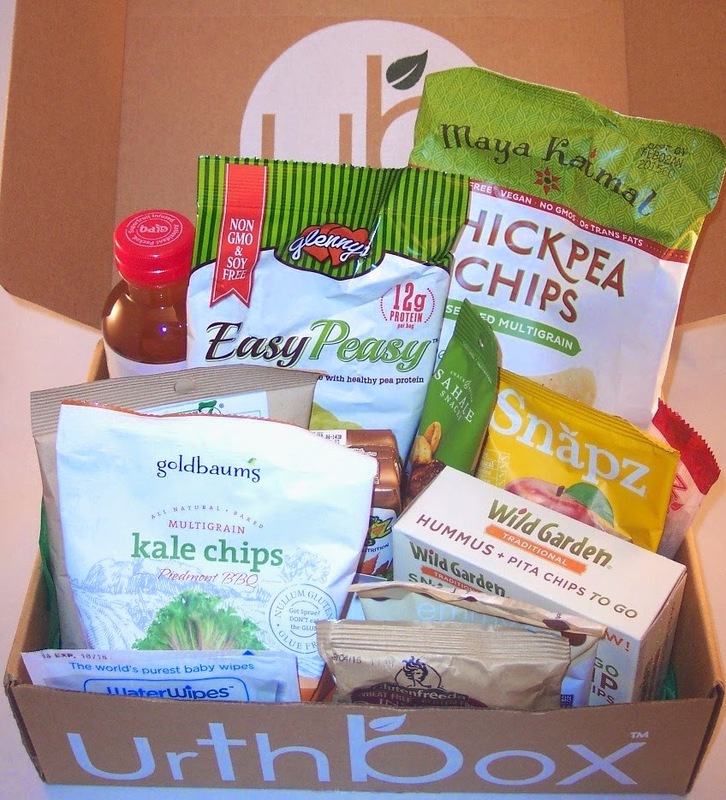 UrthBox Healthy Snack Subscription Box Review, September 2014 + $10 Coupon Code! 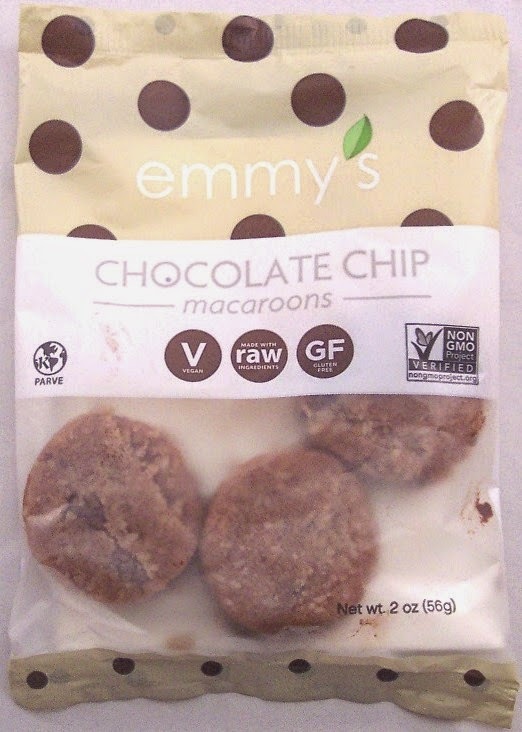 I'm on a mission to try to find a healthy snack subscription that sends foods I really like. Easier said than done. I've tried a lot of them but a new one to me is UrthBox which sends all sorts of healthy foods, snacks and drinks. They have four box options: Classic, Gluten-Free, Vegan and Diet. UrthBoxes come in three sizes. There are significant discounts for longer term subscriptions. The prices shown are for one month, three months and six months respectively. Groupon recently ran a deal on the Medium sized box for $23 which gave me an opportunity to try out UrthBox. It took over a month for the box to arrive which seems like a VERY long time but I guess it does take longer to process orders that go through a third party. At almost four pounds, the box I received was gratifyingly heavy...an important trait in any edible shipment as far as I'm concerned! Inside was quite a cornucopia of healthy snacks....13 altogether! All but one are full size single servings. Six of the products are various types of chips. There is a big 18 oz. bottle of Tanzania Lemonade Tea from Bai5. This is "superfruit infused and full of antioxidants". I'm not a big fan of bottled teas but I'll give this one the benefit of the doubt. Another drink is a chocolate milkshake in a box by Sneakz Organic, which seems like a great name for a product that contains a "full serving of veggies". Somehow, they have packed carrots, sweet potatoes and broccoli into this chocolate shake! If this is at all tolerable, it's a great way to get vegetables into your kids. 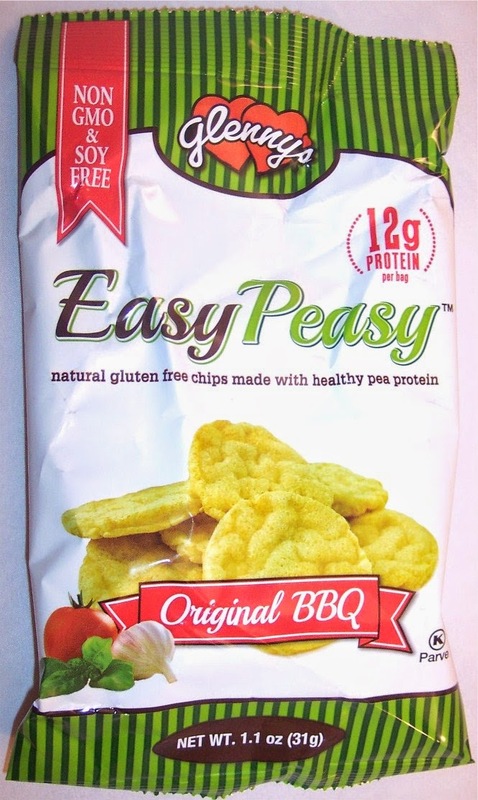 Next is a package of Easy Peasy natural gluten free chips made with pea protein....probably best not to say that out loud! These are in "Original BBQ" flavor, a taste I don't associate with peas! 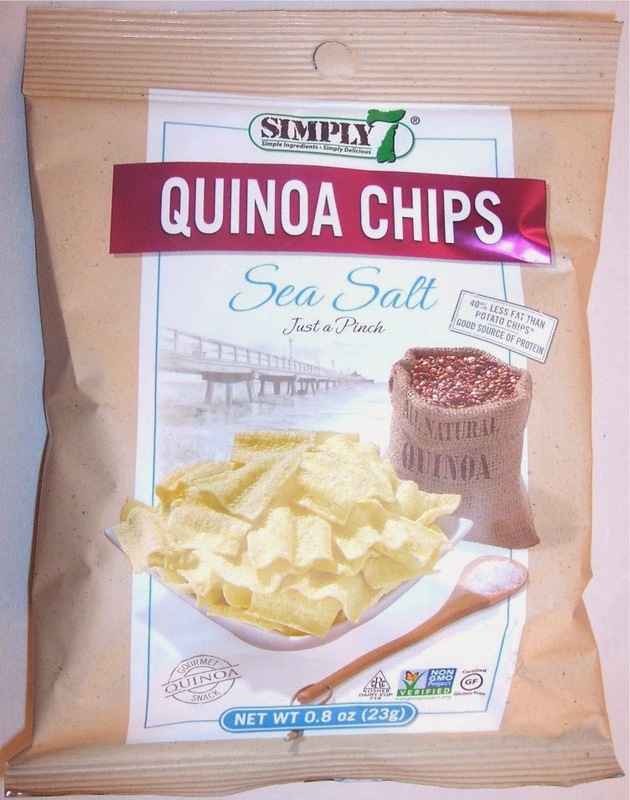 There is a package of Quinoa Chips by Simply 7. These are baked and have a bit of sea salt; I'm guessing I'll like these. My favorite item in this box (I think) is the Mango Tango Almond Mix from Sahale Snacks. These are described as "whole almonds and peanuts with the sweet, tart chewiness of lime-infused mango, punctuated by the subtle kick of chipotle chili". There's nothing "subtle" about chipotle to me but this snack sounds good! 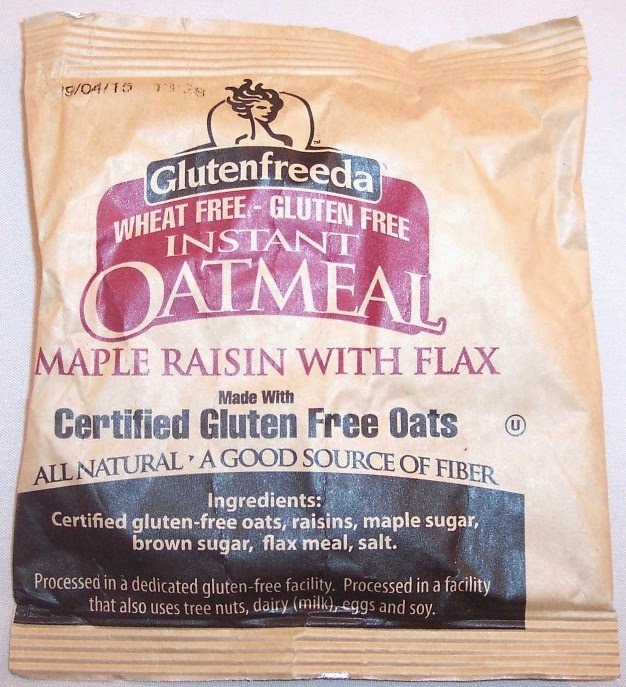 A package of instant oatmeal by Glutenfreeda (awful name) is in the flavor "Maple Raisin with Flax". This contains gluten-free oats (huh? ), raisins, maple sugar, brown sugar, flax meal and salt. 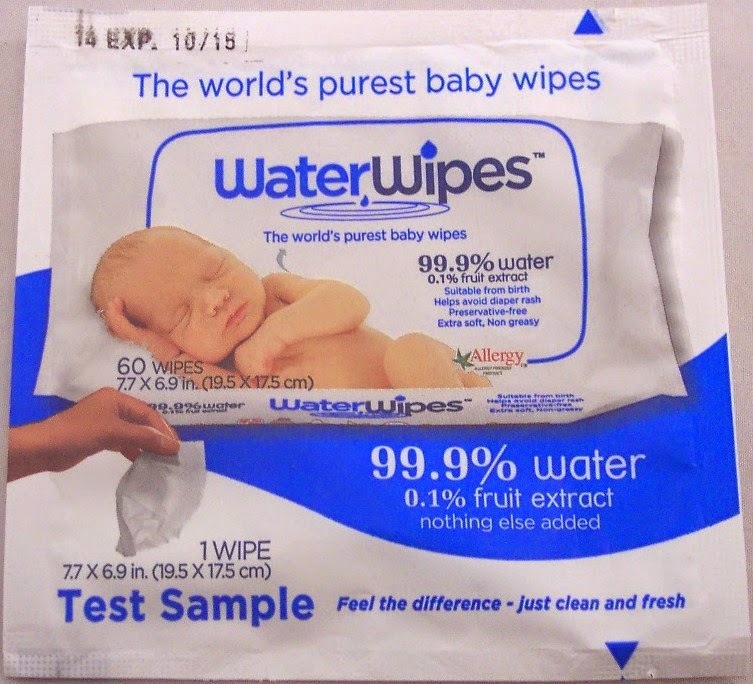 There is one non-edible item in the box, a test sample of WaterWipes, "the world's purest baby wipes". Amazingly, these are made of 99.9% water, .1% grapefruit seed extract and nothing else! They are extra soft absorbent baby wipes. Can someone please loan me a baby? I need to try this out...how can a wipe be almost all water? 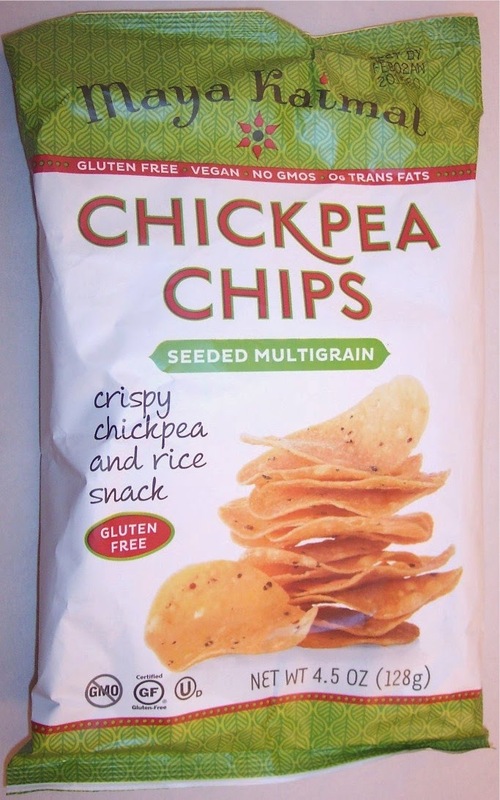 The only multi-serving snack included is a bag of Chickpea Chips by Maya Kaimal. These seeded multigrain crispy chickpea and rice chips actually have a lot of fat (8g) per serving. Looks like this package contains four or five servings. A nutrition bar by NatureCrops is in Quinoa & Strawberry flavor. This looks pretty good and flavorful. Let's just get this out of the way....I don't like kale. There I said it. I know it's not politically correct in a kale obsessed world but I hate the stuff. And it's everywhere. Including chips...where it has no business being. 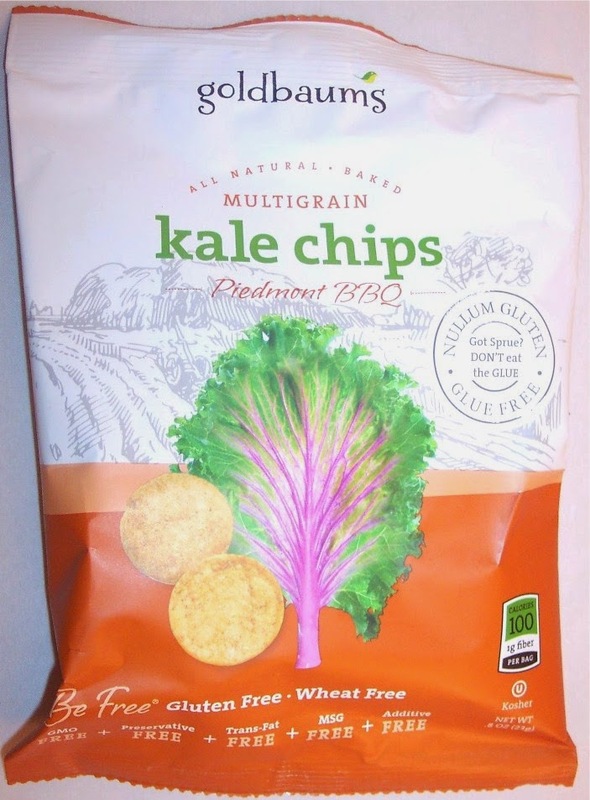 Here we have Goldbaum's Multigrain Kale Chips in "Piedmont BBQ" flavor no less. This just makes me want to go grab a bag of Fritos....chips as God intended! 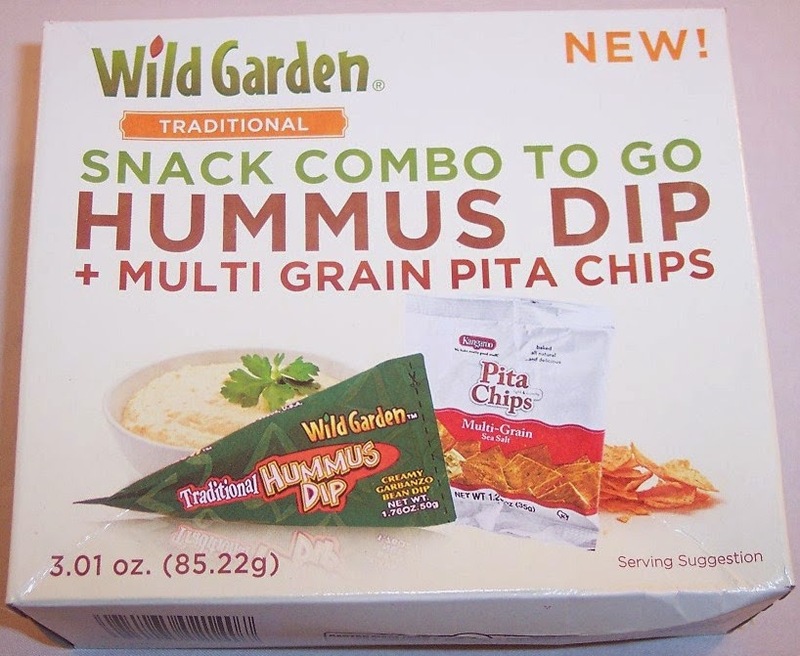 This convenient little snack combo box from Wild Garden contains a package of multi grain pita chips and hummus dip. 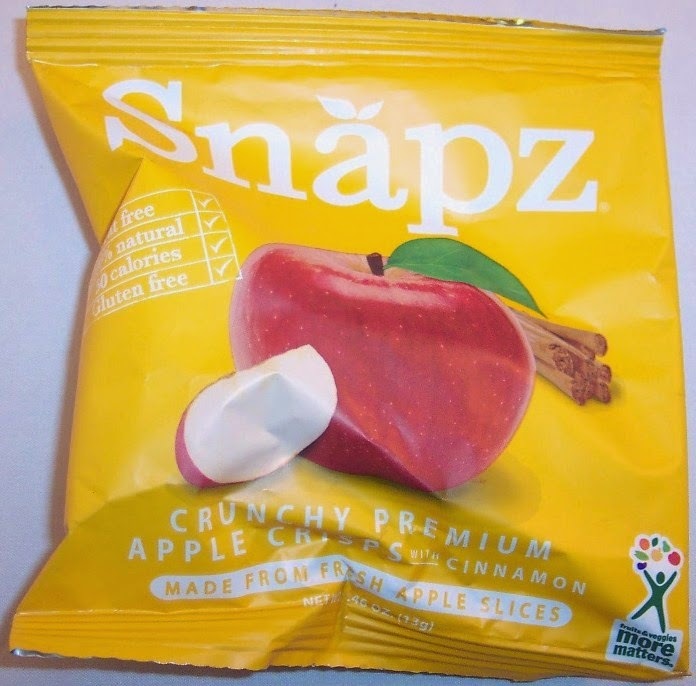 Here's a chip I can get into...."Crunchy Premium Apple Crisps with Cinnamon" from Snapz. This is a very small package which I'm sure I'll inhale. As you can see, I have some serious snacking to do. 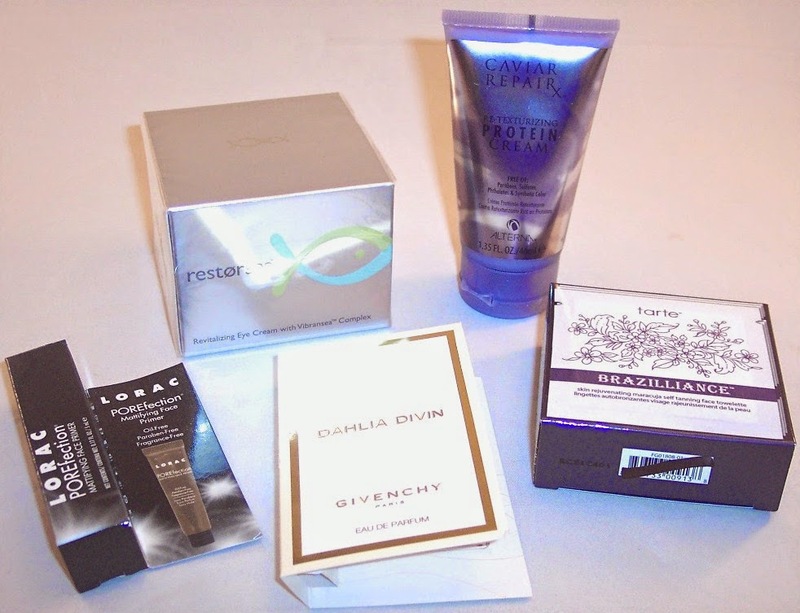 This box provided great value for the price paid and contained a good assortment of products. There are a couple I'll give away but overall, I think there is some potential for expanding my snack horizons. That's pretty much the point of a healthy snack box, isn't it? 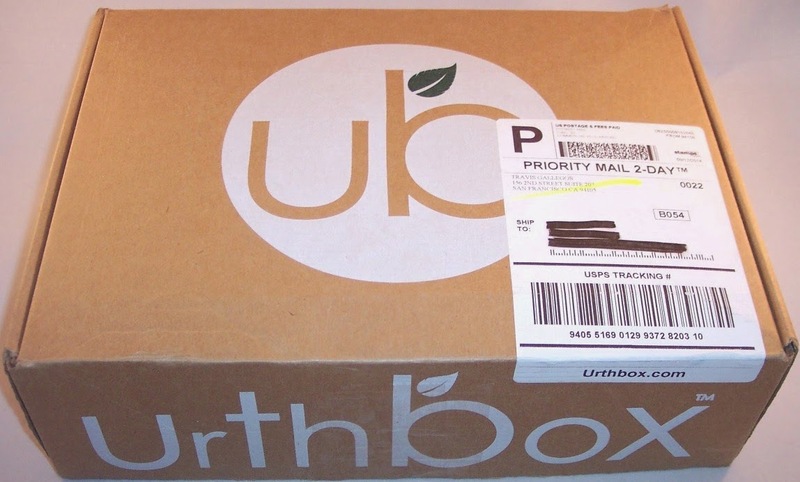 If you're interested in trying UrthBox, use code CRUNCHWEEK to get $10 off your first month. Shipping is free in the U.S. and $6.00 for Canada. Orders placed by the end of the month are shipped on the 15th of the following month. Have you tried UrthBox? If so, what did you think? Let us know below! 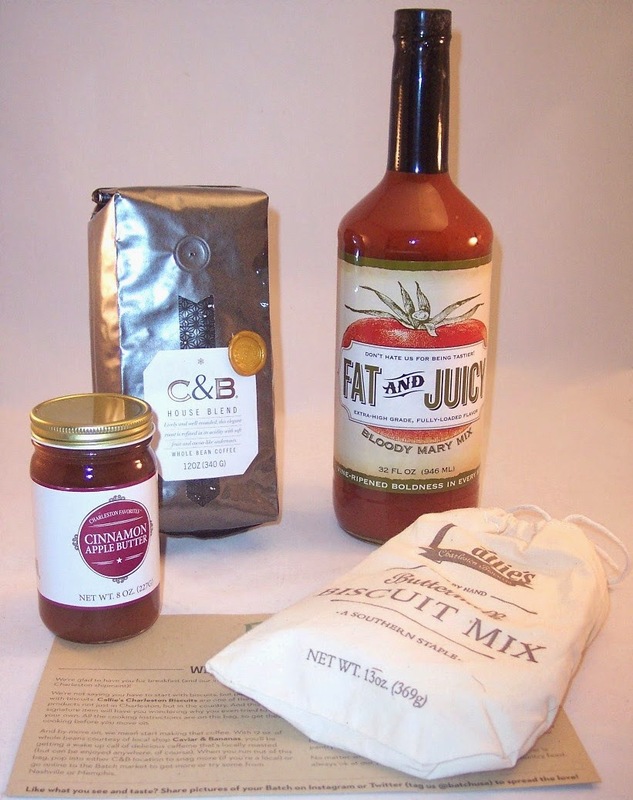 Batch Charleston September 2014 Gourmet Food Subscription Box Review + 10% Discount Code! At almost six pounds, I think the inaugural Batch Charleston box is the heaviest subscription box I've ever received! Unfortunately for me, one product I don't like is responsible for three and a half pounds of that...more about that later. 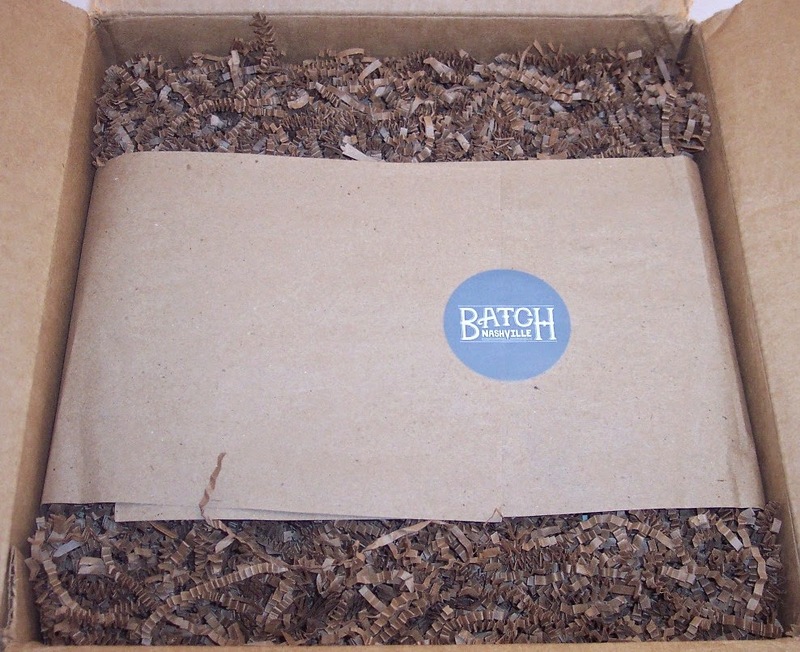 The Batch Nashville people have been spreading their box offerings around to various southern cities including New Orleans, Birmingham, Nashville, Charleston and Atlanta. If you missed my last review on Batch Memphis that also contains the subscription pricing for the various cities, you can catch up here. I really like the idea of city or destination themed subscription boxes and the southern part of the United States certainly provides ample inspiration. 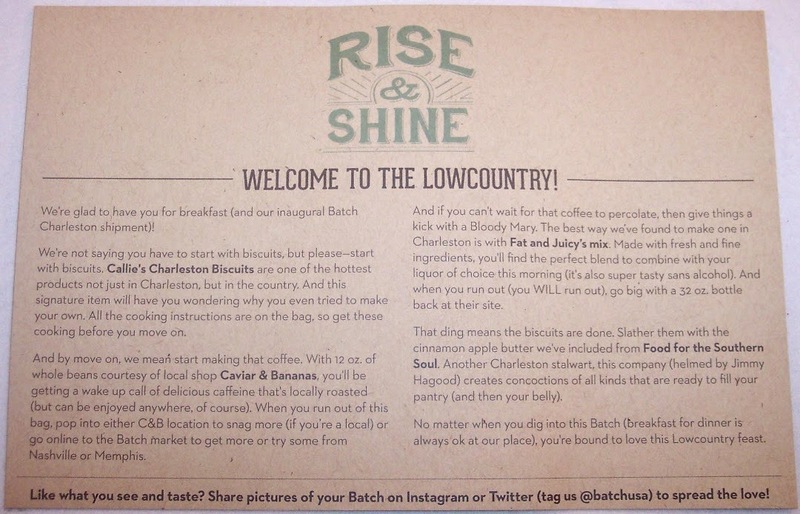 Apparently Charleston is known for its decadent breakfast offerings so the name of this box was the "Rise & Shine Gift Batch". 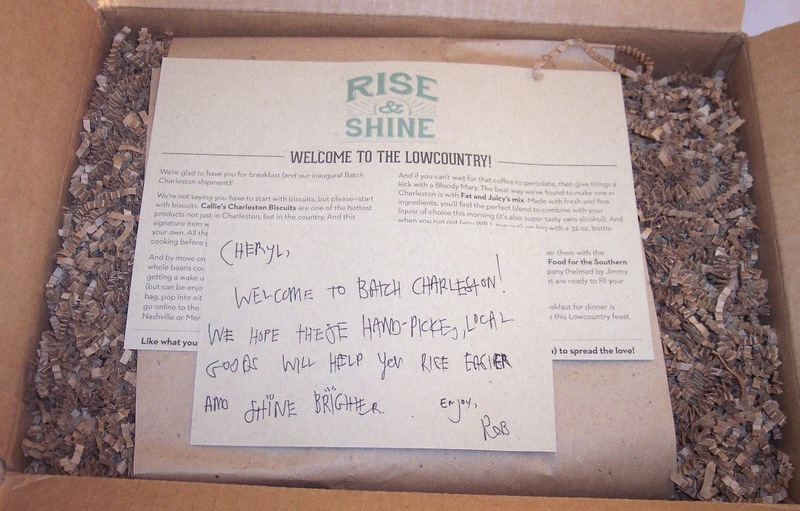 When I opened this enormous box, I was greeted with a hand written note welcoming me to Batch Charleston. That is definitely a first that left a great impression! This box contained four full size edibles which represent Charleston's rich gastronomic culture. The brown information card tells all about the products and how to enjoy them on one side and contains information about the purveyors on the other side. This was quite helpful as I did not immediately make the connection between two of the products that work together as you'll see below. There is an enormous 32 oz. bottle of Bloody Mary mix from Fat and Juicy. Just my opinion but putting such a large item in a subscription box is a huge risk. Some subscribers will love this item; others like me will have no use for it. Of course, the latter will see this as a waste. Some waste is inevitable in subscription boxes due to their inherent surprise nature but concentrating so much of the value in one item can really lead to disappointment. An obvious way to reduce the risk and keep the most possible subscribers happy is to include more and smaller items. Now I'm in the position of not knowing what to do with this gigantic bottle plus feeling that a large part of the price I paid has really been wasted. The ultimate risk is having subscribers cancel due to receiving very large unwanted items. Next is an 8 oz. 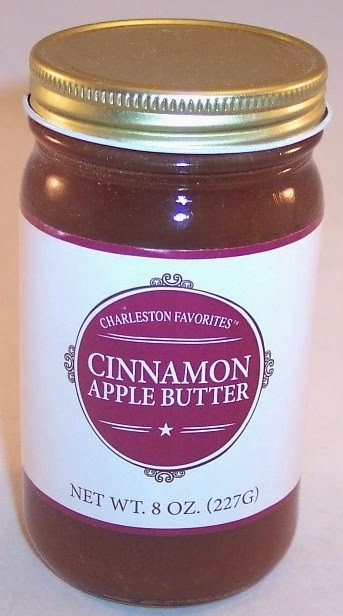 jar of Cinnamon Apple Butter from Food for the Southern Soul. Somehow, it didn't dawn on me that this was meant to be used on the biscuits so I was wondering what to do with it. Thanks to the enlightenment I received on the information card, I now can't wait to try it on the biscuits! The last item is a big 12 oz. package of whole bean coffee from Caviar & Bananas Gourmet Market and Cafe. 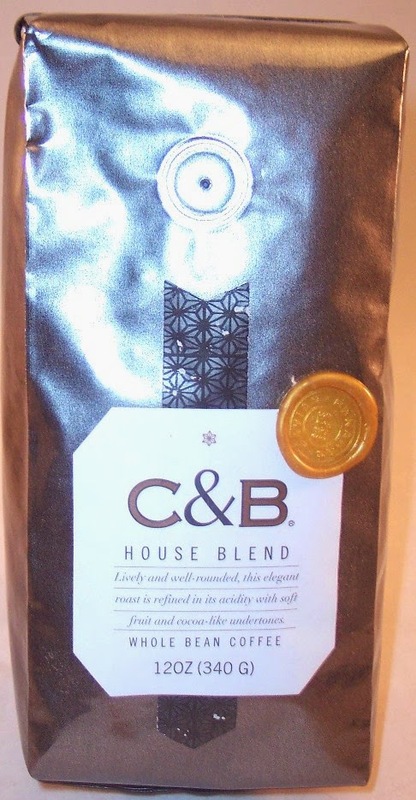 This one is their House Blend, described as "lively and well-rounded, this elegant roast is refined in its acidity with soft fruit and cocoa-like undertones". Although I'm not a big coffee drinker, this description sounds really tempting so I may have to try some. There is plenty here to share! I'm on the fence about this first Batch Charleston box. It clearly contains quality gourmet items that represent the city beautifully. But I'm guessing a lot of subscribers would have preferred a larger number of smaller items so as not to get stuck with one or more big items they don't like or can't use. This is just the first box but I'm hoping Batch will be able to add a little profiling in the future that will prevent (for example) their non-drinking customers from getting huge bottles of drink mix. 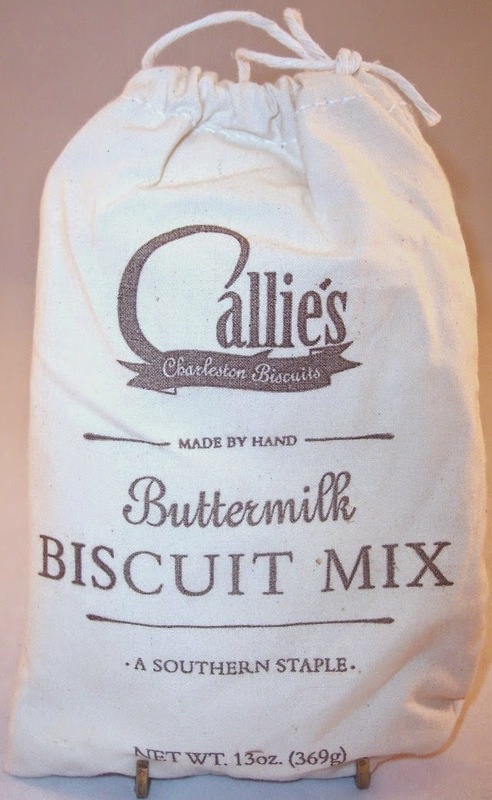 In the meantime, I can't wait to try the biscuits, apple butter and coffee! By the way, you can buy most of the Batch collections on a one time basis for a slightly higher price in the "Gift" section of their on-line webstore. This is a great way to try their products without commitment. You can also buy a lot of the individual items under the "Shop" tab in their store if you want to pick and choose exactly what you'll receive. 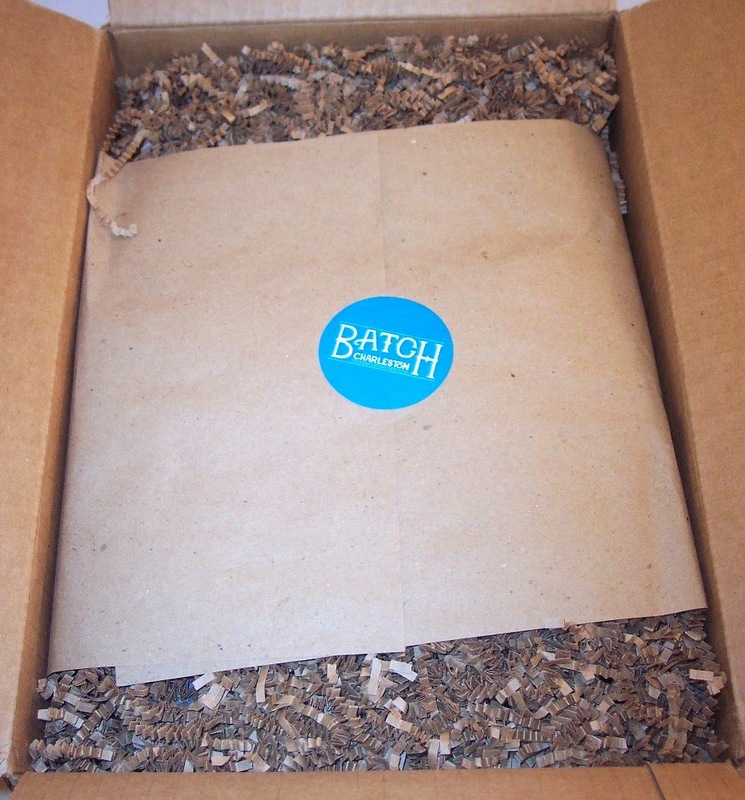 If you'd like to make a purchase from Batch's site, use the code BATCHTASTIC to get 10% off your order. Please be aware that this code is good only for seasonal batch purchases or gift batches. The code does not apply to month to month subscriptions. If you have tried any of the Batch subscription boxes, please let me know what you thought in the comments below!